Wanna a litte sneak peak at what I'm working on? I haven't quite decided where I'm going with it yet. I start the paint and work out the details while I'm at one with the roller. 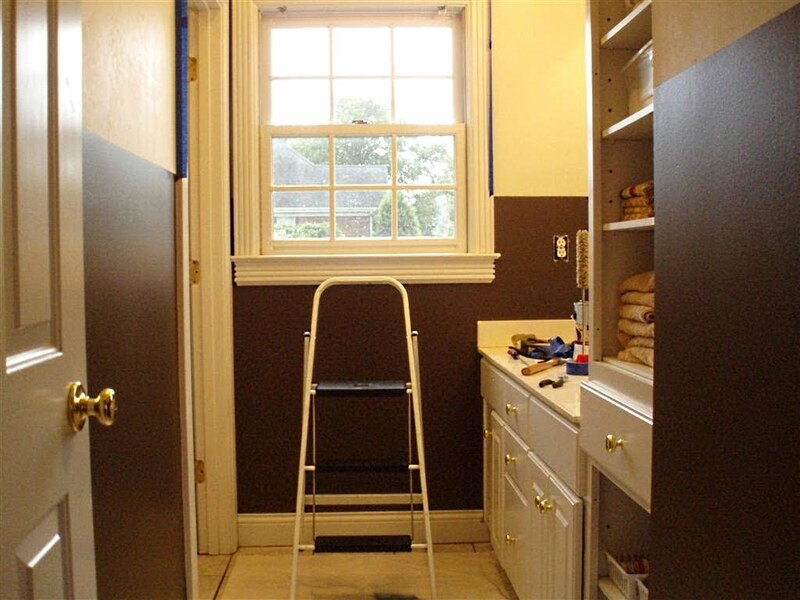 In fact, I went into the bathroom thinking I was going to paint it chocolate brown on top and cream on the bottom. You see that didn't happen, don't you? I have an idea of what I'm going to put on the wall to bridge the two colors, but who knows if that's the way the plan will actually go. For now, I know I'm tired of working on it, so I'm taking a break from it for about a week. I am finished with the counter area. and only the counter area. Since it's a guest bath, I've set it up to reflect a hotel bath. Hubby travels a lot, and when he leaves he has strict orders to bring home all of the toiletries and the coffee packs. He doesn't get back in the door if he forgot them. There's everything you need in this little station: qtips, cotton balls, shaving kit, toothbrush, toothpaste, dental floss, mouthwash, nail file, a selection of shampoos, conditioners, soaps, and lotion, an assortment of laundry soaks, and a tray and bowl to put your miscellany. I mean, after all, we do want our guests to feel welcome here. Ok, so I pulled a litte funny on you and them, but hey, don't we all deserve a little laugh from time to time? I love it and it's staying right where it is. Believe me, everyone that comes to our house knows I have a twisted sense of humor. And they also know that I mean everything in that note! Make one up for your own guest bath and see how quick it becomes a conversation piece. You can copy my verbage or create something that reflects your own personality. "Welcome to the Blair Family Bed & Breakfast. We provide the beds, you provide the breakfast! Enjoy your stay." "Laundry Room's that way. Open between the hours of awake and asleep. Don't forget your soap." It looks wonderful so far! I love the note. Always good to stick some humor in there :) My bags are packed, I'm on my way! I love your little cubbies full of the finest hotel soaps and shampoos. My husband always brought these home too when he traveled. I'm going to have to borrow this idea. And I love the sign! A great touch for the guest bath. I redid my guest bedroom in January but still need to get the adjoining bathroom finished. Thanks for motivating me to get started on that. Too funny! It looks fabulous so far. We also collected all the little toiletries from our trip to Disney and have them in our guest suite bathroom. For $4000 we figured we paid for the soaps too. I love your sign, great humour and my family would appreciate it. We'll have to make one to suit our guests too. Looking forward to your reveal. That is so funny. That little organizer works so perfect for all your supplies. I love the sign too. Can't wait to see the whole bath. The more I get to know you the more I LOVE you!!! That set up is divine. Can I come visit? The richness of the brown is stunning. You risk taker you!!!! Oh I love it!!! 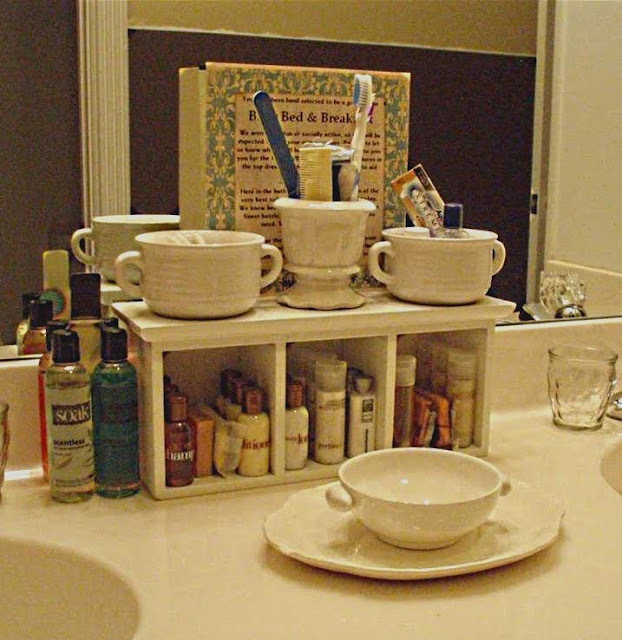 Such a great idea and I am going to have to do something like this in my guest bathroom. You are such a silly girl;)! What a great post! Your little cubby is just too cute...and a such a great ides...the ideas are endless! I adore the sign...I'm glad that it is staying! I love it, so clever ! 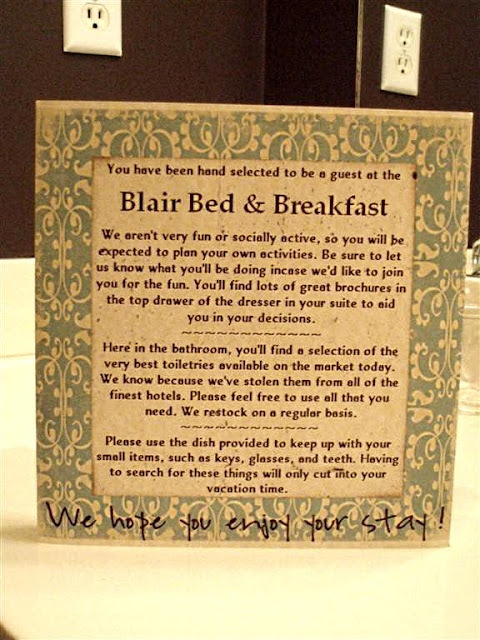 My husband and I are seriously sitting here laughing at your hysterical "Blair Bed and Breakfast" sign. SO CLEVER! Love the bathroom so far! Your guests will be very lucky! And here I thought that I was the only one requesting toiletries and coffee from hotels! Great minds thing alike! This is a super idea, and I do have a place in my bathroom in mind! Can't wait to see the rest! Looks like you have a good start on your guest bath. I love what you have done with your "hotel" toiletries. I have tons of those, just can't throw them away. Your sign is so funny. You do have quite the sense of humor. You deserve a break and have accomplished a lot in the short time you have lived there. What a cute sign! I love your sense of humor. Looking forward to seeing the completed guest bath. My friend, I just had to come over after reading your sweet note that you left for me on my Tea Rose bedroom...thank you sooo much! I always enjoy when you stop by!!! Girl, I love, love, LOVE your quest station! I think that is just the grandest idea...that cubby full of grooming supplies, etc.! Hehe..I'm always wondering what I'm going to do with all of mine when we travel! You've got my "wheels-a-turnin'"! Hehe! And...that sign is just adorable! What a hoot!!! You always have the best ideas, my friend...thank you for sharing them with us! I love what you're doing in the bath! I love the brown on the bottom...with the cream on top! Can't wait to see how it all turns out!!! Well Darlin', thanks again for coming by! I hope that my note finds you and your sweet family doing well! PS...just have to tell you that your cherry table turned out fabulous! You're such a creative and talented lady!! !